Jul. 23, 2017 12:00 p.m.
It’s not every day you see a large group of rappellers going down the 13-storey Stantec Executive Place. But that’s exactly what happened yesterday. 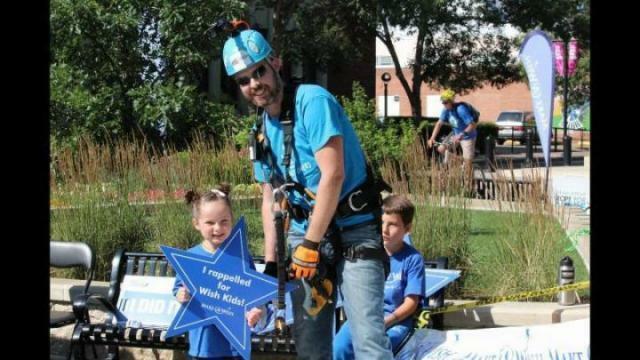 For the first time in Red Deer, Make-A-Wish Rope for Hope took place to raise money to grant the wishes of children suffering from life-threatening medical conditions. “Basically rappellers have raised $1,500 and then they get to repel down the 13 storeys,” said Heather Harcott, fund development and event coordinator for the event. The event follows the mission of Make-A-Wish Canada, by helping to grant the wishes of children with these life-threatening medical conditions, enriching the human experience with hope, strength and joy. Presented by Canadian Western Bank, the Rope for Hope event is in its fourth year in Edmonton, and takes place in many other places across Canada. Harcott said because there are lots of Wish Kids in Red Deer, it seemed to be appropriate to hold the event here, too. “We take participants up until the day of, so people just have to fundraise $1,500 before they go over. If somebody comes on site with $1,500 and they want to rappel we would for sure fit them in,” she said. The donation cut-off is Oct. 31st at 11:30 p.m.
Harcott said the event is about facing your fear, but when you think about what the Wish Kids go through, it’s easy to rappel off a building. All of the money raised from the event will go towards Make-A-Wish Rope For Hope. “The great thing about our charity is that Northern Alberta is its own registered charity, so basically all of the funds that are raised in Northern Alberta stay in Northern Alberta, so the funds raised from this particular event in Red Deer really serve the Red Deer community and surrounding areas,” said Harcott. Money raised will specifically go towards granting a variety of different wishes for the kids. The national 2017 fundraising goal is $1.6 million. One rope is used at the event with 40 people allowed to participate. As stated on the Make-A-Wish web site, there are eight regional chapters, along with the national office that grant magical wishes to children in need from coast to coast. Make-A-Wish Canada is an affiliate of Make-A-Wish International, which has made dreams and wishes come true for more than 415,000 children since 1980.